Mums love name necklaces with diamonds, especially when they serve as a reminder of their children! She’s going to adore our Mum Jewellery – Baby Feet Necklace Gold Plated with Diamonds. Thanks to lots of special touches, it’s truly one of a kind! Choose between one and five baby foot pendants, along with an inscription for each one. We’ll add a diamond accent for just the right amount of sparkle, plus a matching box chain to keep all the charms aligned. This adorable piece is made with sterling silver and 18ct gold plate for a beautiful glow. 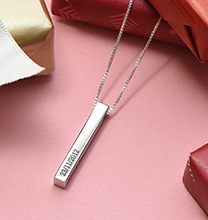 It’s just one of many new mum necklaces in our collection, which also includes this one in your choice of sterling silver or 18ct rose gold plate.